Wireless charging products, including charging mats designed for smartphones, have been available for years. The wireless charging industry now appears primed to take off in new, interesting directions, however. July 2012 projections from Pike Research (www.pikeresearch.com), for example, predict revenues from wireless power systems (mobile devices, consumer electronics, electric vehicles, etc.) will mushroom from $4.9 billion in 2012 to $15.1 billion in 2020. If true, efforts currently in the works will likely play a significant role. One such effort is Qi (which is pronounced “chee”), an open standard championed by the Wireless Power Consortium (www.wirelesspowerconsortium.com), an association of 127 companies with industry ties to mobile phone, consumer electronics, infrastructure, semiconductor, component, battery, and wireless power technologies. Notably, Qi removes a sizable obstacle that has slowed user adoption of wireless charging solutions to date: compatibility among devices. Established in 2008, the WPC published a low-power specification for Qi in 2009 for delivery of up to 5 watts power. The WPC extended the specification in 2011 to medium power for delivery of up to 120 watts. In 2009, the WPC certified the first Qi-based product, and today, there are 110 consumer products carrying the Qi logo, translating to 8.5 million-plus units globally, including 6 million in the United States and 2 million in Japan. More than 120 companies support Qi, which is found in products such as smartphones, charging pads, gaming controllers, Blu-ray Disc recorders, docks, automobile phone chargers, alarm clocks, and charging modules integrated into tabletops and furniture. In short, Qi uses magnetic induction technology to enable charging devices without cords. Place a device using integrated Qi technology or a Qi accessory (such as an adapter) on a Qi-enabled charging surface and charging occurs. Qi stands apart from proprietary solutions in that any Qi device works with any Qi charger or surface. Thus, a smartphone from one manufacturer works with a charger from another, meaning a user could charge her Qi-enabled smartphone in, say, a café or airport where a Qi charger is available. Qi, which translates to “vital energy” from Chinese, is that it’s a standard, something Treffers says enables driving down costs and getting suppliers and infrastructure players interested. “You can see that already now with Qi. I see so many companies investing in it.” A recent example is Nokia’s Lumia 920, a Windows Phone 8 smartphone with integrated Qi technology. 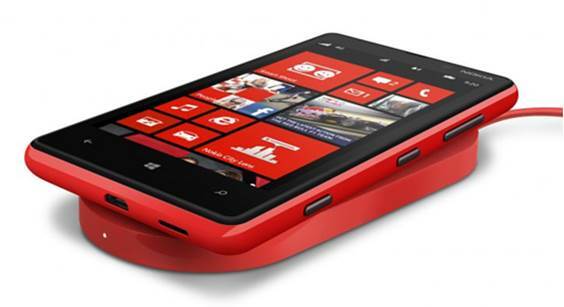 The new Lumia 820 also supports Qi, albeit via a removable shell accessory. Additionally, Nokia is partnering with national café chain Coffee Bean & Tea Leaf to implement wireless charging plates at various locations. Treffers characterizes Nokia’s announcements as “a tipping point” for Qi. Japan, however, is “past tipping point.” Elsewhere, the Kitchen 67 restaurant in Grand Rapids, Mich., recently announced it will enable customers to charge Qi devices via wireless charging technology integrated into tabletops. Reportedly, 120-plus locations in Japan already offer Qi wireless power charging stations in tables. Intel says it is working with peripheral makers, OEMs, and others to “deliver a cost-effective and simpler path to wireless charging.” Usage-wise, Intel suggests imagining a wireless charging solution integrated into an Ultrabook. Upon starting WCT detection software, a user set a smartphone roughly an inch from the Ultrabook, after which “coupling takes place between the two devices and energy begins to seamlessly and wirelessly flow from the Ultrabook to the smartphone.” Within an hour the smartphone would be sufficiently recharged to make it through the afternoon, according to Intel. IDT plans to deliver a full chipset solution for reference design by early 2013. Intel, however, isn’t setting a timeframe for availability of WCT-enabled consumer products.